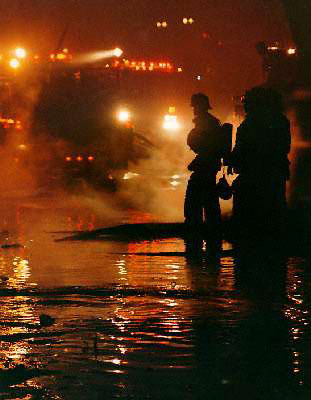 On Wednesday February 22, 1995 at 6:40 p.m., Eleven companies of Los Angeles City Firefighters and 1 LAFD Paramedic Rescue Ambulance under the command of Assistant Chief Alan Schroeder responded to a Greater Alarm Structure Fire at 618 South Santa Fe Avenue in the Industrial Eastside area of Los Angeles. The first companies to arrive on the scene reported a one-story 100' x 200' commercial building with fire through the roof. 55 Firefighters using a combination of handlines and heavy-stream appliances made an aggressive and sustained attack on the fire, confining it to the structure and extinguishing the blaze in just 34 minutes. There were no injuries. Loss from this fire is estimated at $500,000 to the structure and an additional $25,000 to the contents, for a sum total estimated loss of $525,000. The cause of this fire is listed as "under investigation". The companies that responded to this fire were Engine 17, Light Force 17, Engine 9, Light Force 9, Engine 25, Battalion Chief 1, Truck 2, Squad 4, Engine 4, Division Chief 1, Engine 15, Light Force 15, Batallion Chief 7, Emergency Air 1, Rescue Ambulance 9, Light Force 10, Engine 2, Battalion Chief 3, EMS Supervisor 5 and Arson Investigator 2. I took this picture by holding the camera against a telephone pole for a timed exposure, this was the only usable shot out of 6 attempts to capture the image.